Recently I came across an interesting issue related to process chain. While simply going to maintenance screen of the process chains either by tcode RSA1->Modelling->Process Chains or just running of tcode RSPC the screen is not displayed it just hangs. The transaction seems to run and doing something however it is just stuck. WHILE l_nodeid IS NOT INITIAL. 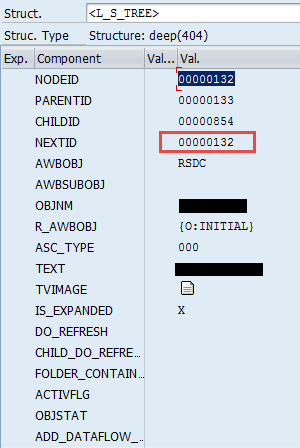 Processing if this WHILE statement never gets inside of inner IF statement because -nextid is never initial. Values of table o_th_tree need to be observed. Especially value of variable l_nodeid. The value of next ID needs to be cleared out in the debugger and transactions related to Process Chains will be available again. Root cause of this issue lies within inconsistencies with an Application Component. This means data inconstancies in table RSCOMPTLOGO and or RSCOMPTLOGOT. If trick within the debugger doesn’t help than entries in in above mentioned tables need to be removed. How to change broadcast setting’s owner? How to find out SM12 entries...?